Linda Saunders received her B.S. in Wildlife Biology from the University of California at Davis, and her M.A. in Biology from California State University at Chico, California. Her thesis examined what defines essential nesting habitat for the northern goshawk in McCloud, California. 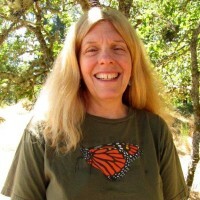 Linda worked for the U.S. Forest Service for 16 years as a wildlife biologist in California, Alaska, Idaho, and Washington, working with a variety of species such as woodland caribou, grizzly bear, gray wolf and northern spotted owls. In 1993, Linda transferred to the U.S. Fish and Wildlife Service where she specialized in gray wolf and grizzly bear issues, serving on the North Cascades Grizzly Bear Technical Committee. She is currently working for Wolf Haven International as Director of Conservation, overseeing restoration work on the mounded prairie on site, as well as providing input on various federal and state proposals for gray wolf management in Washington and throughout the United States.